The Gorges du Tarn route, from Sainte Enimie at the top, to Millau at the bottom. Back in 1905, in the very early days of motoring, the "route des Gorges du Tarn" was one of the very first specific tourist roads to be built in France, on the instigation of the young "Touring Club de France" which had established a purpose-built hotel, the Grand Hotel de la Muse, at Mostuéjols, near le Rozier. And ever since, it has remained one of France's most spectacular touring routes. In 2015, it was showcased as never before when the riders of the Tour de France cycled up through the whole length of the gorge. The tunnels and rocky overhangs along the route will be hazards to negotiate with care, notably for all the accompanying vehicles with cycles on their roofracks. Just as they are every day of the year for the tourists who venture along this twisting road at the foot of one of the longest and deepest gorges in Europe. The Gorges du Tarn, and of two tributaries la Jonte and la Dourbie, cut through a high limestone plateau area known as Les Causses, which is classed as a UNESCO world heritage site. Though the river Tarn is a tributary of the Garonne, and its waters eventually flow out into the Atlantic ocean, the Tarn Gorge is part of the Mediterranean hinterland of southern France. Millions of years ago, if the waters that wore through the limestone of the southern Massif Central had chosen a different route, they might have flowed out into the Mediterranean; but that did not happen. But the hills through which the gorge winds its way, known as Les Causses, are definitely part of the South of France, part of the limestone fringe that borders the Mediterranean basin from Gibraltar to the Alps. The gorge enjoys a microclimate that can make it very hot in summer, relatively mild in winter. Around Millau, the valley is famous for its cherries and its vineyards, and as far up as Saint Enimie, small vineyards cling to the valley sides, and in summer the air can be full of the cheeping of the "cicadas", the emblematic crickets more generally associated with Provence. A journey through the Tarn gorge can start and finish anywhere, but what better place to start than the small town of Roquefort, in the Aveyron, home of the world's most famous blue cheese, just south of the Tarn valley, to the southwest of Millau. The pretty village of Peyre, near Millau, in early spring. The Millau viaduct, from Peyre. the river, is a "plus beau village de France", and worth a visit. Unlike many of the "plus beaux villages", Veyre is not too over-touristy. Shortly after Veyre, the road passes beneath the spectacular Millau viaduct on the A75 motorway, before reaching Millau, the "capital" of the Gorges du Tarn, and of the Gorges de la Dourbie, a tributary. From Millau, the route turns north. Leave Millau on the D809 (former N9) as far as Aguessac; it is here that the proper "Route des Gorges" begins. The route through the Gorges is the D907, which in the Lozère department becomes the D907bis. Thirty-two kilometres north of Millau, you reach Les Vignes. Here it is worth taking the steep twisting road up out of the gorge towards Saint Rome de Dolan, then turning off to a stupendous viewpoint known as La Pointe Sublime, dominating the deepest part of the gorge. Then back down to Les Vignes, from where you'll now follow the narrowest and most impressive part of the gorge - the section with the tunnels and the overhangs, as well as spectacular views of vertical rock faces, cascading waterfalls, and even a historic village on the other side of the river, Hautesrives, that has no road access. Houses cling improbably between rockface and river, near Sainte Enimie. The northern end of the classic "Gorges du Tarn" route is at the small town - or is it a large village - of Sainte Enimie, from where it is either possible to continue up the Tarn valley as far as Florac, or turn north towards Mende, or south to the Causses and on down to the Mediterranean coast. Canoes and kayaks can be hired at numerous points in the Tarn Gorge, and notably at Sainte Enimie, La Malène, les Vignes and le Rozier. At la Malène, there are also boat trips on the river for groups of up to 8 people. While driving, hiking, cycling or canoeing through the gorge, visitors should look out for the area's impressive bird life, which includes France's largest population of griffon vultures, as well as many other birds of prey. Large clusters of vultures, among the largest of European birds of prey, can often be seen wheeling on the thermals that rise up from the warm floor of the valley. Towards Florac, lammergeiers, another type of large vulture, have also been successfully reintroduced in recent years – not to mention the eagles for whom this rugged terrain is perfect territory. Millau lies on the A71-A75 motorway route to the south of France, between Clermont Ferrand and the Mediterranean coast. Easiest access to the deepest part of the gorge is to leave the A75 at exit 38, follow the N88 east in the direction of Mende, then turn south at Chanac or Balsièges, following signs for the Gorges du Tarn and Sainte Enimie. Alternatively, leave the motorway at Severac le Chateau (exit for Aire de l'Aveyron); the exit for Severac is actually 1 km along the N88 dual-carriageway in the direction of Rodez. From Severac, after visiting the medieval château, follow signs for the Gorges du Tarn and Saint Rome du Dolan. The descent from Saint Rome to Les Vignes is breathtaking. Aven Armand : Amazing natural cavern, with superb stalacmites and stalagtites. Montpellier le vieux : a karstic chaos of limestone rock formations, said to resemble an ancient ruined city. The site is accessible along well marked, but quite rocky, footpaths, but also by "petit train touristique" for those who prefer a more leisurely visit. Spectacular views over the Gorges de la Dourbie. La Couvertoirade : minute walled Templar city, on the barren Causse du Larzac, south of Millau. Roquefort : Visit the underground caves and cellars where the world's most famous blue cheese is matured. Unusual places in France - A choice of dramatic landscapes and offbeat monuments in France. Byroads through France - Drive down from the north to the south of France on byroads, taking in plenty of interesting places en route. 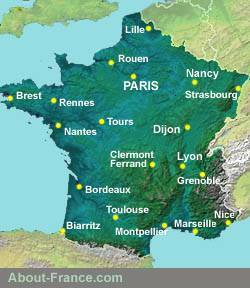 Best French towns and cities - places larger than those on this page, the well known and the less well known..
Walled cities in France cities and towns that are still surrounded or largely surrounded by their ancient walls. Wild France rural France and French hill country. Copyright text and photos © About-France.com 2007 - 2019 except where otherwise stated.